Should youever find yourself thrust into a survival situation—you get hopelessly lost,your vehicle breaks down in the backcountry far from help, your bush planecrashes in remote territory, etc.—you will need to deal immediately with seriousconcerns such as treating injuries, creating shelter, attracting the attentionof rescuers and obtaining water. Obtaining food, if you do not have any, ismuch farther down the priority list. You probably can live for days, perhapsweeks, with little sustenance. If yourunfortunate situation continues days instead of just hours, however, foodbecomes increasingly important. Having something to eat helps the survivor maintaina positive attitude and healthy condition. Without it, your struggles will bemuch more difficult. Perhapsyou’ll be fortunate enough to have a survival kit with you, and you stocked itwith an assortment of fish hooks, lures and line. If so, wonderful. You’reready to start catching fish. But what if you have no fishing tackle. How canyou catch fish then? This taskprobably won’t be easy. But with the knowledge you’ll gain reading thisarticle, you’ll be better prepared to catch fish to eat. There’s nothing “sporting” about survival fishing. Use any method at your disposal, but only in a true survival situation. Improvise; use any available material to create the fishing tackle you need. Don’t overlook the possibility of catching smaller fish, which are usually more abundant and more easily caught. Hooks canbe improvised from many materials, including needles, safety pins, nails, paperclips, thorns, a bird wishbone or claw, a piece of metal cut from a can, evenan old soda can tab. Don’t overlook any possibility. If a knifeis available, you also can whittle hooks in the traditional shape from wood,shells or bone. A simpler type of hook, the gorge or toggle hook, has been usedby primitive peoples for centuries. This is a short (1-inch or less), straightpiece of hard material such as bone, antler or wood that has been sharpened atboth ends and slightly notched in the middle where it’s attached to the line. Thegorge is hidden inside a piece of soft bait, and when a fish swallows the bait,the fisherman pulls the line and the gorge turns (hopefully!) sideways, lodgingit in the fish’s throat. Fishingline may be harder to procure but can be made from many materials that might beon hand, including threads in clothing and equipment, pieces of wire, dentalfloss, sinew from the leg of a deer, twisted bark or whatever else isavailable. Most good survival books offer tips on improvising. You canmake lures from pieces of cloth, feathers, an earring or bits of bright metalfashioned to imitate natural food like a minnow or insect. In many waters, allyou need to catch fish is a strip of colored cloth attached to a hook. 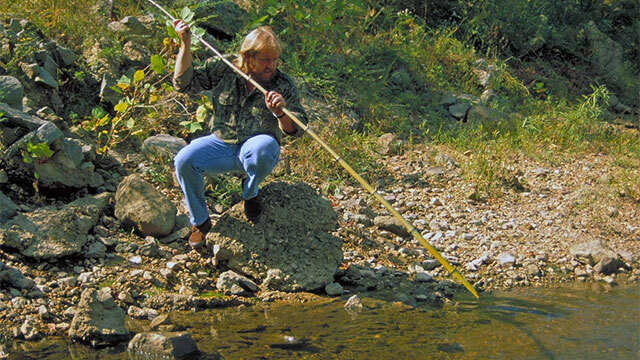 Yourimprovised gear can be fished with a makeshift pole or as a hand-line. Anyextra should be used to create setlines that will fish while you are away.Attach each to a stake driven in the ground beside the water or to springygreen branches overhanging the water. There ispractically no end to the makeshift spears you can concoct. A sharp piece ofbone, wood or metal can be lashed on as a tip, or you can simply whittle theend to a sharp, barbed point. This type of spear is very effective when used atnight with a torch while wading shallows. A jawedspear may provide a better way of capturing fish. Split one end of a long greenwillow pole or other sapling 6 to 8 inches on one end. Carve sharp, rear-anglingteeth into each flat side in the split. Use cordage to bind the split’s upperend so it won’t split farther. Open the “jaws,” and prop them open with a twigstrong enough to separate them 2 or 3 inches. When you thrust the spear downover a fish, the twig is knocked out, and the jaws snap shut, holding theanimal. Theadvantage of spearing fish is you can select larger fish. However, this methodrequires a lot of patience and practice for success. To catchfish in tidal waters or rivers, consider using a fish weir constructed the wayNative Americans did it centuries ago. Begin by driving stakes (longer than thewater is deep) side by side into the bottom in shallow water to create arectangular fence with three sides. The fence’s open end should be on thedownstream or downcurrent side. Next, drive more stakes to create a V-shapedwall that points into the open end of the rectangle. The point of the V shouldbe left open so fish are funneled into the weir. Such a trap also can be constructedof rocks placed in similar fashion. Fish that are trapped inside can be caughtby hand or speared. The trap’ssize will depend on the material at hand and the size of the water in whichyou’re working. Even small ones work well. The best have side walls extendingto the bank that allow fewer fish to pass. In muddy water, try herding fishinto a trap, starting downstream and driving the fish in front of you. If it’snot too cold, and you can find undercut banks, holes beneath rocks, hollow logsand other dark recesses in shallow water, you may be able to catch fish byhand. In many parts of the country, this is called “noodling,” and it’s anexcellent way to catch catfish, suckers and other species. Try to block thehole so the fish won’t shoot out, then reach inside and move your hands alongthe fish’s side until you can grasp the mouth or gills. You also can spear fishin holes, or catch them with a stout hook attached directly to the end of apole. In smallbodies of water where minnows and other small aquatic animals are plentiful, anet improvised from a shirt or other piece of cloth stretched between twosticks can be effective. Push it before you as you work your way toward a smallcove or bank. When you reach the shallowest water, lift it quickly and removethe catch. At times, this method yields more food than fishing with hook andline. Primitivepeoples have long used certain plant parts to poison or stun fish. Mullein andbuckeye, both common in many parts of North American, are reported to stupefyfish when the leaves, stem, flowers, and in the case of the buckeye, the nuts,are crushed and dropped into small shallow pools. The crushed green hulls fromblack walnuts and lime made from mussel shells cooked in a fire and crushed aresaid to work in similar fashion. Unless youcan keep them alive in some type of trap or on a stringer, all freshwater fishshould be cooked as soon as possible after catching to avoid spoiling. Manycontain parasites that make them dangerous to eat raw, so cook your catch bysteaming it in a wrapping of leaves, boiling it in a makeshift cook pot,broiling it on a sheet of scrap metal or roasting it on a stick. If youfind yourself in a survival situation, the fish you catch and cook yourself mayprovide the best meals you’ve ever had.